Eid ul-Fitr or Id-ul-Fitr, or simply Eid for short, is the annual Muslim holiday marking the end of Ramadan – the Islamic holy month of fasting; Hari Raya Aidilfitri or Hari Raya Puasa for my many Malaysian friends. As follow-up to my September 12 post entitled ‘Some tips to touring Jordan during Ramadan,’ I thought it might be an interesting cultural lesson to those traveling in the Hashemite Kindom during this “festival” (Eid) celebrating the “break of the fast” (ul-Fitr). The three-day Eid al Fitr holiday begins Tuesday in nine Arab states, with the exception of Egypt and Syria, after Muslim scholars sighted the crescent moon, overnight, bringing an end to the month of Ramadan, according to Islam’s lunar calendar. Religious authorities in Saudi Arabia, home to Islam’s holiest shrines, said the new moon had been sighted and that Ramadan would end on Monday with the feast to follow the next day. Lebanon and Jordan made similar announcements. The Islamic calendar is a lunar one, and most Muslim countries set the beginning of Eid al-Fitr by the sighting of the new moon. But Libya — where the feast also begins on Tuesday — uses astronomical calculations. The end of Ramadan is announced via e-mail, postings on websites, or chain phone calls to all members of a Muslim community. 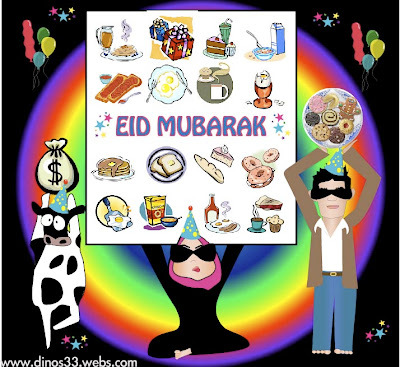 … Its EID! Woo hoo! I love waking up early on EID! (only on EID i would rather sleep any other day). So we go to EID prayer then ofcourse we go to have BREAKFAST! i miss having a big yummy breakfast! Pancakes! Fried Eggs with Toast and Croissant & jam! The arrival of Eid and the end of Ramadan cut my weekend with the Bedouins short last night, as our group was piled into a late night bus that took us back to Amman, arriving at about 12:30 am. Despite this, I had another great experience here in Jordan. I spent my weekend with a Bedouin family in the village of Naifa on the Baghdad Road, which, not surprisingly, goes to Baghdad. Jordanian Drift – EID MUBARAK!!! So happy and blessed Eid to all the wonderful people I’ve met in Jordan – I look forward to seeing you again at some point in the future; though when I can’t tell (years?-). ← Best Online Photo Gallery of Petra Ever!